Congratulations on starting your own Senegence/LipSense business! I am sure you are thrilled, but you also may be a bit lost as to what to do next. Don’t be worried about that, I am going to help you through everything! (If you haven’t signed up yet, you can do so HERE). After you sign up, you will receive some emails. You will get an email from Senegence, welcoming you to the company and giving you some important information about your account and Back Office. Make sure to save this email. You may want to create a Senegence folder in your inbox. You will also receive an email from me with some Important Next Steps, a Welcome Packet and a link to join our Team Facebook Group. In that group, there will be tons of resources available to you for every part of your business. I will be following up with you weekly via email, messenger, or a phone call for your first month to make sure you are on track with your goals. Your first 30 days can set the tone for your business, so I want to help you start off running! I provide trainings on social media and blogging, if that is how you want to build your business. We also have monthly incentives, inspiration, and tons of support. You will learn how to network and grow your business without being spammy and cold messaging friends from long ago. 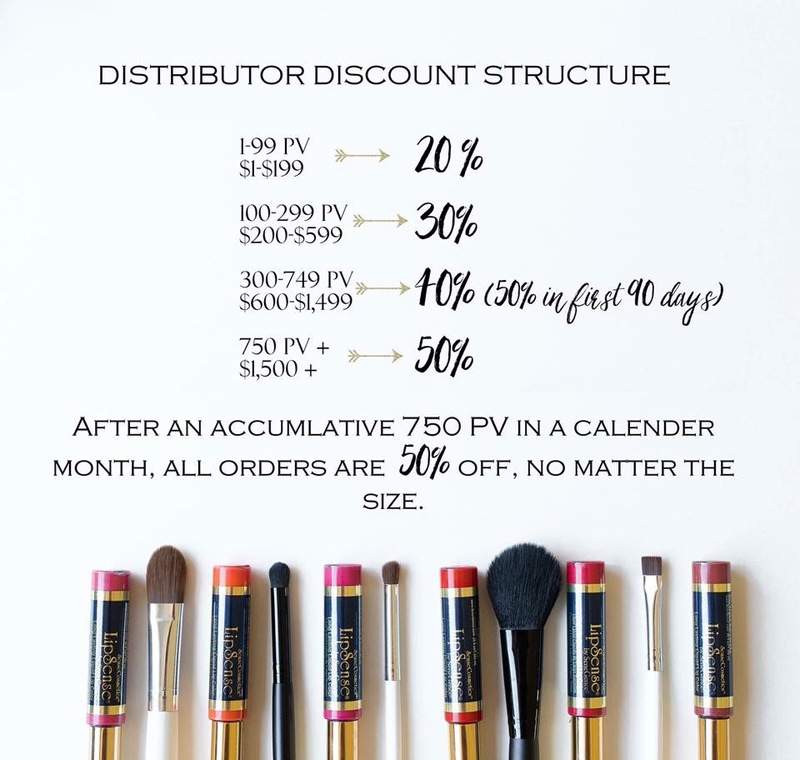 This post is just a quick glimpse into what is provided when you become a distributor on our team. You can expect full support and tons of amazing ladies to connect with on your journey! Good question! I know it can seem overwhelming. You are so excited to start and you just don’t know how! Start simple. Read the emails you got from Senegence and from me, and make sure to store them in a safe place. Take a look at your Back Office and familiarize yourself with it. This will be the hub of your business! There is a wealth of information in your Back Office…almost never ending! Download and/or print the Product Guide from your Back Office, take a look at the videos and trainings in there and just browse around. Don’t go through everything all at once, just get a feel for it, and go back daily to learn something new. Check the files in the team page, as there is also tons of information in there. Understand the discount structure of your business. This is important because you want to know how to earn the most profit and maximize your savings. Don’t forget – in your first 30/60/90 days, you can take advantage of the Jump Start program and get 50% off retail and earn over $1200 in products. What Should I Order To Start? I can help you place your first order. 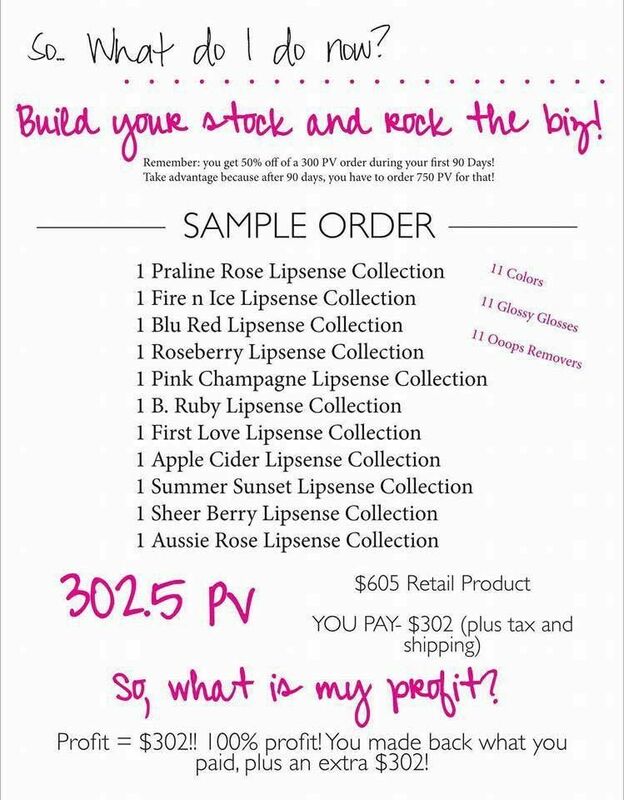 As shown above, you really want to place a 300PV order so you can maximize your savings and income. You will have no problem selling this, trust me! We are going to be setting up your Launch Party and you’ll be pleasantly surprised at how fast this first order leaves your hands! 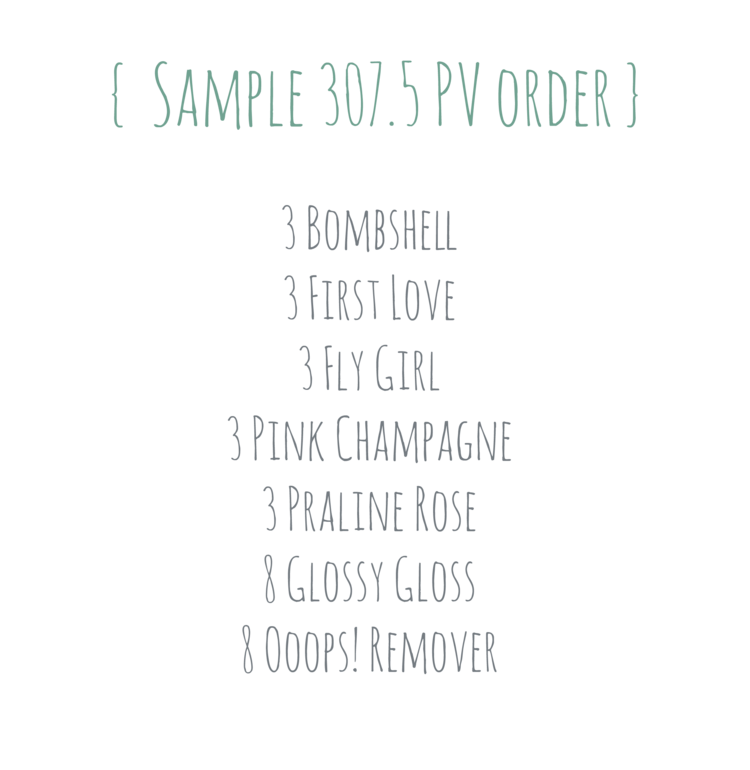 These are some good starting points for your first order. Remember, you want to be wearing LipSense yourself and have a few colors available as testers. Reach out to me and I can help you place your order. We will have plenty of training on social media! If you are coming from another business or are a blogger, you likely have social media accounts and a following. That’s great! If you don’t, no worries at all! For now, decide on a name for your business. It can’t have “LipSense” or “Senegence” in it, but you want something that speaks to you and something you can brand. If you will be using that name on your various social platforms, check to see if it is available on your platforms of choice, and set those up. If you are a blogger, decide how you will incorporate your Senegence business and name into your blog. Many distributors choose to invoice via PayPal or Square. Use whatever you are comfortable with. I use and highly recommend Trello…desktop or the app. It’s amazing and free! I organize my whole life with Trello! I also use a paper planner, because I am a paper person at heart! This is the one I use, but you can use any planner that you will actually use. Set up files on your computer now, so you will be organized right from the start. Decide where you will store your files…desktop, folders, in the cloud. Do you need to upgrade your storage? Do you need to download any apps to help you take better selfies or keep your organized? You are excited, right? Share that with others! Tell your family and friends that you just found this amazing product and you know they would love it! If you signed up for the business opportunity first, share that excitement! I promise you, there are other women out there, just like you, who would love if someone told them about this opportunity. Don’t be salesy, or pushy. Don’t cold message people you haven’t spoken to in years. Just be real, and give without expecting to receive. Focus on others. You have a gift, just share it. And always, reach out with any questions! I am so happy you have joined our Sisterhood! What a great business to be part of! I’ve seen this brand at parties before and everyone loved them! I never knew any of this. Pretty cool.